To further enhance the service we offer, we have, over the past twenty years, become associated with three other leading Dublin Funeral Directors – Fanagans, Nichols and Carnegies. Collectively, we offer ten funeral homes and offices located throughout Dublin City and County, all managed to the highest professional standards. Our service is available twenty four hours a day, seven days a week, with every call answered personally, irrespective of the time. No answering machine – instead, a person-to-person telephone conversation is guaranteed at all times. 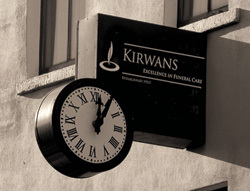 "The person at Kirwans actually pointed out a number of unnecessary things we had been considering and helped us to reduce costs substantially"